"Otitis media" means there is fluid in the middle ear behind the eardrum. The type of fluid present varies, and thus there is a spectrum of disease from "Acute Otitis Media" through to "Glue Ear" (sometimes also called Otitis Media with Effusion, or OME). When the eardrum is red and bulging, with fluid or pus behind the eardrum, often associated with pain and fever, this is called "acute otitis media." "Glue ear" often follows "Acute Otitis Media" or may occur on its own. Fluid is present behind the eardrum, but there is no fever, and the eardrum is not inflamed or bulging. In some instances, the eardrum is actually retracted inwards to varying degrees. An acute ear infection, with abulging ear drum. 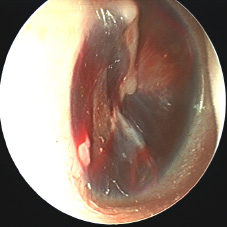 Opaque ear drum with middle ear fluid present. There is also some white calcium in the ear drum. 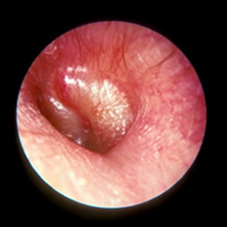 Both glue ear and acute otitis media occur most commonly in young children, usually as a result of temporary malfunction of the Eustachian tube, which connects the middle ear to the back of the nose. The Eustachian tube normally allows air to circulate through the middle ear, and allows mucus to drain from the middle ear in to the throat. In young children, the tube is smaller, flatter and shorter. It is easier for bugs (bacteria and viruses) to travel into the tube, which may result in swelling of the lining of the tube, and an increase in mucus production in the tube. This may cause it to block. It follows, that as children grow, they are less likely to have trouble with otitis media. Are Some Children More Likely To Develop Otitis Media? There is no clear evidence supporting allergy as a causal factor in the development of otitis media. There is some limited evidence linking bottle feeding to early development of acute otitis media. This may be because of the immune protective effect of antibodies passed through breast milk. 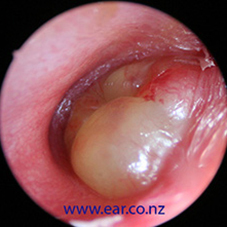 Acute Otitis Media may result in severe ear pain, fever, grumpiness/misery and night waking. The hearing is reduced. More severe complications (burst eardrum with discharge from the ear, mastoiditis, meningitis) are uncommon, but do occur. 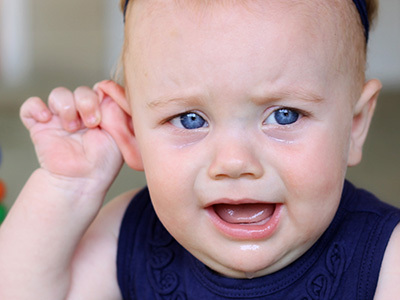 Rarely, a child may have few symptoms even with very inflamed ears. Balance may be temporarily affected in some children. Glue ear may have few symptoms. There is usually no fever, but ear pain may still occur, particularly at night when children lie down. There is usually hearing loss: in some children this may be only mild, and in others, this may be sufficient to delay speech and language development for many years. This may have implications for effective learning at preschool and school. Often parents feel, erroneously, their child is ignoring them. Balance may be affected and the child may seem clumsy. Adults may also suffer both acute ear infections and glue ear, usually as a result of narrowing of the Eustachian tube/s. Blotches in the ear drum sometimes seen several days or a week or so after an ear infection. Pneumo-Otoscopy is the best way to diagnose Otitis Media. Your Doctor performs this. A small torch with a magnifying lens and a funnel attachment is inserted into the outer ear canal and the eardrum and ear canal are examined. An attachment with a small air reservoir puffs air into the ear canal and moves the ear drum in and out a little. Limited movement of the eardrum can help confirm Glue Ear in doubtful cases. Tympanometry is a test to assess the movement of the eardrum. Air is puffed in and out of the ear canal and a probe in the ear canal detects sound echoing off the eardrum. Tympanometry may be useful in doubtful cases, and is also used as a screening tool for Glue Ear, particularly in preschools and kindergartens. Tympanometry is not a hearing test and a "pass" on this test does not necessarily mean that a child can hear - it just means that it is very unlikely Glue Ear is present at the time of the test. Hearing Testing is a very valuable tool in the assessment of glue ear and its impact on the hearing of an individual child. No child is too young to be tested, however testing does need extra time and special techniques in children under age two and a half to three years of age. Your doctor may recommend a hearing test if Otitis Media has been present for three months. We are able to perform testing for children 5 years of age and over at our Gillies consulting rooms, and testing is also available at most public hospitals,or at some private audiology centres such as Dilworth Hearing Ltd.
What Treatment Is Recommended And Is It Necessary? Antibiotic treatment is recommended for acute otitis media in children under age two. This has a modest effect in the reduction of pain and fever and may reduce the risk of complications of acute otitis media. However, there remains a lack of evidence about the benefits of antibiotics in older children and adults. Paracetamol is usually effective for reduction of pain and fever. Sometimes it is necessary to use oral anti- inflammatory medicines (such as ibuprofen (Brufen/Nurofen) for pain and fever control. 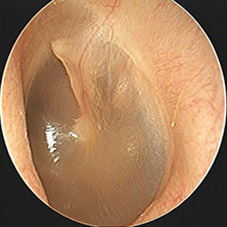 Grommet insertion may be recommended for recurrent episodes of Acute Otitis Media. There is no absolute definition of the number of episodes required before grommet insertion is recommended, but a rule of thumb is 6 episodes in a year, or four over a six month period. This would also depend upon the time of year (more likely to be recommended if Acute Otitis Media is recurrent through the summer months, when the incidence should usually be at its lowest) and individual factors, such as predisposing risk factors and occurrence of complications of Acute Otitis Media (such as febrile convulsions or vomiting). Hearing aid/s. These may be used temporarily until the glue ear resolves. They are funded through the ‘Children’s Hearing Aid Fund’ and are available from public hospital services. They are also available from private audiology centres also, but with an additional fitting fee charged. Grommet (ventilation tube) insertion. This results in resolution of the middle ear fluid, and in addition reduces occurrence of Acute Otitis Media. Grommets are discussed further below. Other treatments, which have been used, include decongestants (e.g. Pseudo ephedrine), antihistamines (e.g. Phenergan) and steroids (e.g. Prednisone). There is no evidence for their effectiveness or benefit. Cranial osteopathy and homeopathy are available at some centres- unfortunately there is no evidence that these are more effective than observation alone. Antibiotics make little or no benefit either. 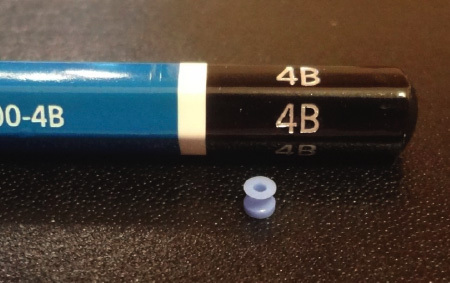 A far less commonly used "T Tube" Grommet typically used for persistent severe ear troubles. 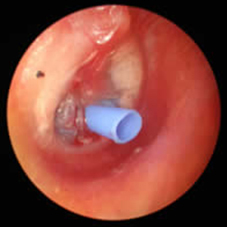 Grommets are tiny plastic flanged tubes, which are inserted through a small nick in the eardrum to allow air into the middle ear until the Eustachian Tube begins to function normally. They come in various different sizes, which last in the eardrum for different durations depending on the size of the flange inserted into the middle ear. The most common ventilation tubes I use last between 6-12 months ("Shepard")and 12-15 months ("Sheehy"). This may vary considerably in individual children. Tube selection is sometimes dependent on personal preference of the surgeon, influenced by the season at time of insertion and the desired duration of action. Grommets eliminate middle ear fluid by allowing air into the middle ear from the outside - they are not "drains". Allowing air in from the outside through the grommet enables mucus and fluid to drain in the normal way down the Eustachian tube. There is usually improvement in hearing and reduction in frequency of acute otitis media episodes. Parents often report improvement in balance and walking ability, and an improvement in well being and happiness of the child. Many times, there is an improvement in sleeping at night. The grommets are inserted while under a short general anaesthetic (asleep). The surgery usually takes 10 to 15 minutes. Children are often able to return home an hour or so afterwards. There is not usually any pain in the ears after. Follow up with the family doctor and specialist is necessary until the grommets have come out and the eardrums have healed without further Otitis Media. Approximately 30% of children may require further grommets. The risk of complications from a short anaesthetic provided by a specialist anaesthetist for an otherwise healthy child are extremely low. They should be discussed with the anaesthetist prior to surgery. 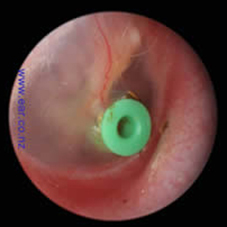 A small risk exists (1% - 5.0%) of a persisting hole in the eardrum after the grommets come out (extrude). My audited figures suggest a risk of under 1% in children who have grommets for the first time. An operation to repair a hole (perforation) may be necessary when your child is older, often around 8-10 years of age. The operation has a success rate of 85- 95% in experienced hands. Holes or perforations left after grommet extrusion vary in size and consequence. The main problems experienced are intermittent discharge (often as a result of water going in to the ear from the outside) and mild hearing loss. This may occur from time to time in some (up to 40%) of children. It is not normally painful, but does mean that the ear is infected and should be treated with ear drops (e.g. "Ciloxan or Maxitrol ") for 5-7 days, rather than oral medicines which are not usually required to treat this. Up to 4% of children may have persisting discharge or frequently recurrent discharge from the ears. 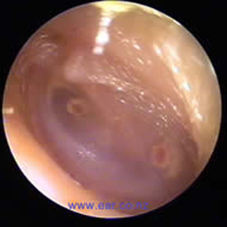 There is commonly a small scar in the eardrum after the grommets extrude. This does not damage the hearing in any way. 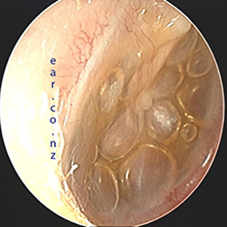 More significant scarring can occur in the eardrum or middle ear, but is usually a result of more severe disease than as a result of grommet insertion. Swimming is normally safe with grommets in place. They will not fall out, but there is a small risk of ear infection and resultant discharge through the grommet. As treatment of an infection is usually straightforward and routine and ear protection using ear plugs can be very aggravating to parents and children, many doctors don't recommend ear plugs as a matter of course. There is often considerable geographical variation in recommendations, however, mostly dependent on local water conditions and quality. If necessary only, protect your child's ears from soapy water or from water in public swimming pools and rivers/lakes. Swimming in the sea has a lower risk of ear infection. To protect the ears, I recommend a large segment of "Blutac" placed in the ear hole. Alternatively, use cotton wool mixed with Vaseline, insert into the ears and then cover with another layer of Vaseline on the outside. Silicone putty, or earplugs are available from most pharmacies. Fitted earplugs ("Docs Pro Plugs") can be very useful for regular swimmers. A swim cap or ear wrap may also be useful to retain the ear plugs. Grommets may extrude prematurely but the odds of this occuring is up to 4%. Occasionally a grommet may block, and need saline or antibiotic ear drops (such as Ciloxan, maxitrol or sofradex) to help clear it. Approximately 10 % of grommets may not extrude spontaneously within 3 years. If this is the case, they should be removed under a further brief general anaesthetic to minimise the risk of leaving a perforation of the eardrum. I perform the surgery at Gillies Hospital (in Epsom, Auckland) on Wednesday, Thursday or Friday Mornings. We cater to the youngest children first- as all children and adults need to be starved of food and fluids for 6 hours pre operatively. Operating starts at 08.00. Before the procedure, the anaesthetist (usually Dr Paul Baker,Dr Andrew Wongor Dr Graeme Knottenbelt) and I will discuss any further queries with you and to ensure you are familiar with post operative care. Children who have grommets only are usually able to go home one hour after the operation. Although they may be a little unsettled for a few hours, the operation is not sore and they are usually their normal selves by afternoon. It is common for children to tug or play with their ears after the procedure (even for some weeks or months). All children are reviewed post operatively by my experienced ENT Nurse Specialist Fleur Bolton, to check all is well, and then I recommend regular 4 monthly checks with your family Doctor until the grommets have extruded and the ear drums have fully healed. If you would like to make a booking for surgery, my secretary will do all the arrangements for you.